In a small town north of Hanoi is a Drug Rehabilitation Centre where young men are experiencing the grace and love of Jesus Christ. They are being made whole, delivered and set free from drug addiction and a life of crime. After attending the two year program at the Centre the men often return to their communities. There they lead fruitful lives following Jesus Christ. A number of these young men are serving in local churches, some planting churches in their home village after family and friends witnessed the dramatic turn around in their life. “Everyday I receive calls from mothers wanting me to take their sons into our program, but I can’t. We just don’t have any more room.” said the founder/leader of Bethel Rehab Ministries. This first centre, opened in 2008, houses over 35 clients. Extension are needed to cater for the high demand of young men needing to enter the program. 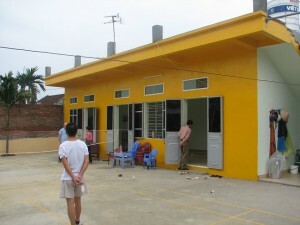 There are now seven other centres operating in different regions around Hanoi. Young men are being saved, healed and set free from their addictions. It is such a great joy to see these men now living transformed lives. Many of them were living with a death sentence hanging over their lives due to the incurable damage done by years of drug abuse. Some were even in the last days of their life, waiting to die, when a believer reached out to them with the message of life in Christ. Now they are living, healthy, active and productive lives, serving Jesus Christ. Most of the staff at these centres are volunteers. Some might receive support from family and friends and/or by attempting to run small businesses to generate some income.